Marsha the Mallard nested in a courtyard of an office building near 4th and Wisconsin in downtown Milwaukee. She thought this was a good idea because her nest was well-hidden in the shrubbery, so no predators could see it. It was just a few blocks to the Milwaukee River. Marsha incubated the eggs in her nest for nearly a month. 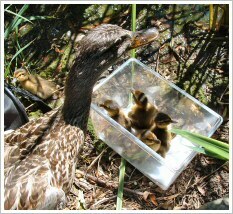 All went fairly well until a few hours after her seven ducklings hatched. Marsha decided it was time to lead her little family out onto Milwaukee Street, across Wisconsin Avenue and onward to the river. Fortunately it wasn’t rush hour, but the traffic was still very busy and dangerous, and the little family had some close calls with cars and trucks! Two nice security guards guided Marsha and her brood into a doorway to try to keep them safe until help arrived. The guards placed a call for help to the WHS Wildlife Rehabilitation Center. Our Wildlife rescuer was able to safely net Marsha and scoop up her babies without mishap. 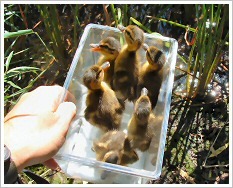 We transported the ducks directly to the Veteran’s Park pond and here you see Marsha and her ducklings being released into the safety of the pond’s cattails.